Polar bears look like a white mammoth-sized animal that navigates through the Arctic sea ice whilst camouflaging into the Arctic snowy background. Polar bears are remarkable species and quite many aspects of white bears justify a detailed description perhaps rightfully. 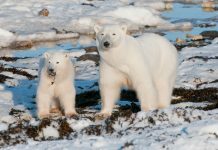 Andrew Derocher, a leading polar bear researcher, says that if you’re searching a polar bear in the Arctic look for the yellowish white object, preferably one that is moving. 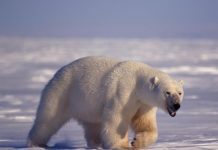 In this article we are going to discuss what do polar bears look like in the wild habitat. Polar bear fur isn’t actually white. It is pale yellow in color which is precisely due to lack of a pigment. If you take a fur snippet you’ll notice that it appears like glistening glass fibers. That means that the polar bear fur aren’t white at all, they just look like one. Polar bear furs are transparent. They reflect light. Thus, if you observe a polar bear during sunset it’ll probably look orange-red in appearance rather than white. Polar bear is a big bear by any standards. The weight of an adult male is estimated at 1760 lbs (800 kg). They grow up to a length of 8.3 feet (253 cm). 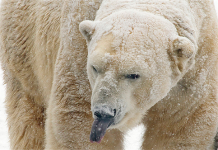 Female polar bear weighs over 990 lbs (450 kg) and it averages up to 7 feet (214 cm) in the overall length. According to polar bear hunters, there are 10 to 12-foot bears inhabiting the wild but they are not really confirmed. The largest polar bear has the shoulder height of about 133 cm (4 ft 4 in). The evidence suggests that the biggest polar bear weighs over 2,200 pounds. 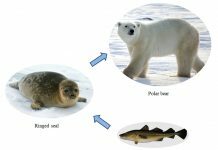 Main Article: Do Polar Bears have Tails? Yes, polar bears have tail but it is probably not as noticeable as bear’s other parts. The bear tail measures around 3 to 6 inches (8 to 15 cm) in length. Scientists do not know however what function does polar bear’s tail serve apart from keeping the bear’s rear warm. 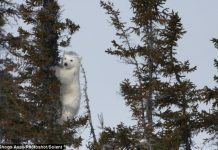 Andrew Derocher claims that he has seen quite many polar bears that have long tails. When the bear defecates, the tail opens up just like a trap door. Polar bears have short sturdy legs which are all covered with dense fur. They have unusually wide paws. 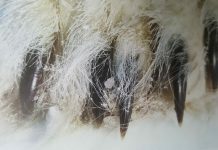 Bear’s furs are also found underneath its paws to protect her from cold during long walks. 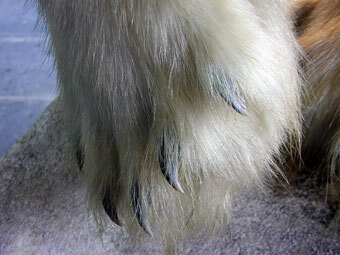 The pads of the paws provide polar bears with traction and grip on the ice. The 30-cm-wide feet distribute the polar bear weight over the sea ice.